This month I’ll talk about both sizes of the Lie-Nielsen Froes. Now, some tools are extremely commonplace, as in it seems like many of us came out of the womb knowing what they are, like a hammer, a chisel, or a screwdriver. On the other side of the coin are tools that seem to have had a bit more limited exposure, like a froe. When I was first getting interested in woodworking (24 years +/-), I happened across a book that was a compilation of old woodworking articles, and in one article, they mentioned using a froe. Since I’d never seen a froe personally, at that point in time, I found it both unique and interesting. After reading the article (wish I could recall the author), occasionally I’d see an old froe at a garage sale, an estate sale, or even at an antique store. Many of the old froes I’d see were in such bad repair they were really no longer worthy of work, even though they ran the quality spectrum, from nicely crafted blacksmith units to those cobbled together by a user snatching an old leaf spring from a truck, and bolting on a piece of wood for a handle. Enter the Lie-Nielsen Froe, designed in cooperation with Drew Langsner. Drew is an expert with regard to riving or splitting green wood with decades of experience, translating this knowledge into newly designed familiar tools. He redesigned the traditional froe with several key improvements. The large version of his froe has a blade 3/8” thick x 1 1/2” wide x 12” long, and a 17 1/2” long handle of hard maple. The smaller version has a blade 1/4” thick x 1 1/4” wide x 8” long, and it’s handle (also hard maple) is 13 1/4” long. The large froe’s longer handle (think levering action) and thicker blade (more rigid to adequately apply the extra levering forces) make it the obvious choice for working larger pieces of wood, but it can also easily finesse smaller pieces. If you will never even think about splitting a larger piece of wood, and you prefer a nimble and lighter tool, the smaller froe is for you. Those of you familiar with froes will immediately notice a few unique aspects of these Lie-Nielsen froes, such as the manner in which the attachment point is created and the handle attached, as well as the thickness of the blade. Rather than taking a single piece of metal for the blade and creating an eye for the handle by wrapping one end of the metal back around to itself, the blade is welded to a cylindrical ferule. This ferule is sturdy, having no weak areas like many of the older froes. The old froes also usually had a tapered eye, so the blade couldn’t accidentally slide off of the wooden handle in the working direction. Where the old style was basically a wedge/friction fit, the new Lie-Nielsen froe’s ferule is held onto the end of the handle with a stepped washer and a large lag screw. The working edge of the blade that contacts the project wood is beveled at 30 degrees. This beveling facilitates easier entry into the wood, which can decrease the amount of force required from your mallet or maul, potentially increasing the life expectancy of that accessory, too. The 30-degree bevel is suitable for use in either hard or soft woods. For those of you who have never before tried a froe, or may not have ever even seen one, let me describe some basics. 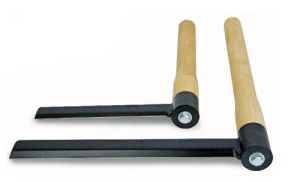 A froe is an “L” shaped tool, with a straight piece of metal connected at a 90-degree angle to a wooden handle. The froe is used primarily on green wood (wood that hasn’t yet dried). The froe’s metal blade is placed on the end-grain of the wood you wish to split, and a large wooden mallet is swung down onto the back of the blade, driving the blade into the wood. Depending on the wood (or your strength this morning), it may take a couple of good heavy whacks to move the blade deep enough to either initiate the splitting action, or position the froe so you can force the wood to split. Some wood will just easily give up, and split as though you were the master of the universe. Others will mock you, and do everything but call you names, while refusing to split. After the froe is down into the end-grain about a full blade’s depth, you can either pull the handle towards yourself, or push it away to utilize what might best be called the levering action. This is where the thin blade of the froe is rotated in the wood, so the opening that started about 1/4”-3/8” (the blade’s thickness) or so, is forced open gradually. As the blade rotates, not only does the opening become wider, but the split also runs further down the piece. Now move the blade further down, into the new area of the split, and rotate the blade again. Depending on different factors, you may need to place wedges in the gap behind the froe to help keep the initial split open while working down the wood. This process is repeated until the split is open the full length of the wood, and you end up with two separate pieces. Since the wood from this process follows the grain, you end up with blanks/boards retaining all of the wood’s original strength. This grain continuity is exceptionally useful and especially sought after for a multitude of uses, including green furniture making and more. Click to take a closer look at the Lie-Nielsen Froes. Those are some great useful tools. I recall my grand father using them, to make shingles as well as splitting wood, for making rustic furniture as well as firewood. I’d sure love to get my hands on one. I’d like to make some nostalgic rustic furniture, that I recall him making. Also, to make some rustic shingles, for constructing some planter boxes. I want to get one soon—very soon. I’ve seen some froes available, elsewhere, on todays market, that feature a longer blade. I’m sure you company has evaluated the longer blade, and perhaps do not feel a 15” blade is necessary. Brings back memories, from years past—wood working with my Dad and Granddad. They were some very skilled craftsman. Thank you for accepting this message and giving this matter your attention. You will hardly ever spit material even near as wide as the blade is long. The length is there for other reasons. 1) Sometimes the spit develops very rapidly, and you don’ want the knuckles of your holding hand to be scraped against the wood. Hurts! 2) Once the froe blade is buried in the wood you may want to continue striking it with your wooden club (used to start the process.) Simply, you need some exposed blade to strike. And it’s nice if you can strike towards the blade end, or near the handle. 3) Not so important, as the blade is lengthened there is some risk of bending it — You’re abusing the tool if this happens. Also, the longer blade makes the tool heavier and it effects the balance. I’ve seen Asian woodworkers use a smaller (6-12″), in-line froe to split bamboo into slats.